This Ready to Ship Table Skirt For Sale is In Stock Now! 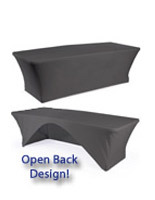 This Tablecloth with Unique Fitted Design Gets Your Company Noticed! Fabricated from 70% polyester & 30% spandex for stretchable. Machine-washable & wrinkle-resistant for use in different events. 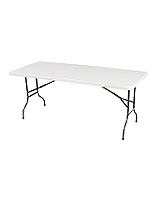 Stretch fabric wraps the top and three sides of a 6' table. 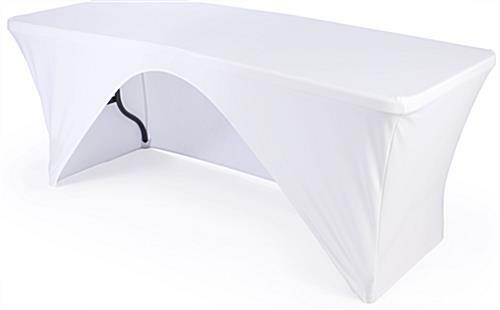 This discount table skirt for sale, also known as a contoured table cover is a great alternative to ordinary tabletop linens. Set-up is easy. No clips or pins required! 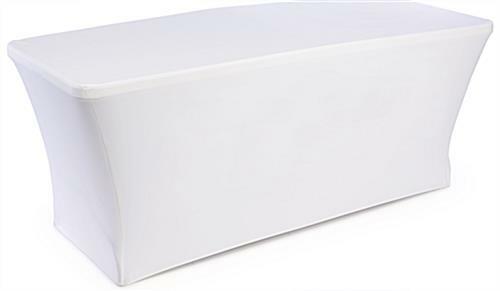 Every fitted table skirt, like event covers and polyester tabletop cloths, feature stitched-in compartments into which table legs are inserted for a snug fit. 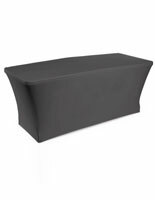 With an open back design, you'll have lots of area to store event supplies and also have a space for workers sit in the back without a draped table skirt getting in the way. 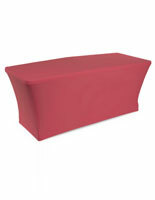 Buy this fitted table skirt for your upcoming event now! This fitted table skirt is mainly utilized in event exhibits. 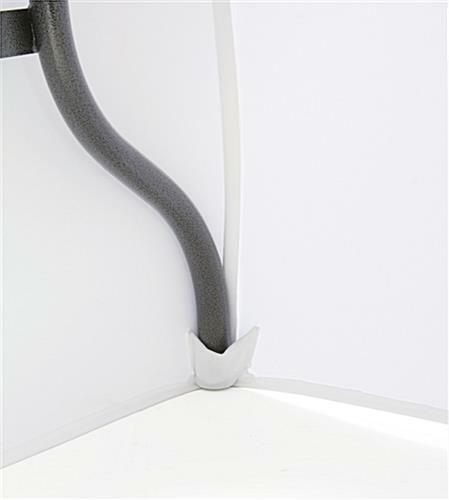 Stretchable tabletop coverings are often seen at recruiting events and hospitality areas. Every fitted table skirt is stitched to fit snug to your 6-foot table. 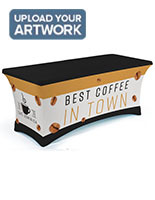 Produced from a blend of spandex and polyester, this table skirt will cover your tabletop flawlessly, without wrinkles, and offer a smooth exhibit surface area. 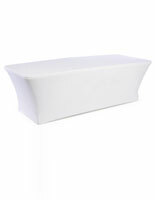 The neutral white color of this table skirt means that it effortlessly enhances every event booth. The tabletop covers are sold without images or logos, permitting you to make your individual customized display, which also allows the table skirt to be used for many different functions! 72.0" x 29.0" x 30.0"